If you’re a bit worried about a friend or family, it’s time to use SLOPE! Give the person opportunities to talk. It can be helpful to let the person choose when to open up. However, if they do not initiate conversation about how they are feeling, you should say something to them. Speak openly and honestly about your concerns. Choose a suitable time to talk in a space you both feel comfortable where there will be no interruptions, when you are both sober and in a calm frame of mind. Use ‘I’ statements such as ‘I have noticed….and feel concerned’ rather than ‘you’ statements. Listen to them and give them time to talk about how they are feeling. Resist the temptation to give advice or dismiss their concerns. If your friend discloses personal information, keep their trust by not sharing the information with others. Show that you’re listening. Use your own body language and gestures to convey your attention. If the person would like information, make sure the resources you provide are accurate and appropriate to their situation. Look below for some links. 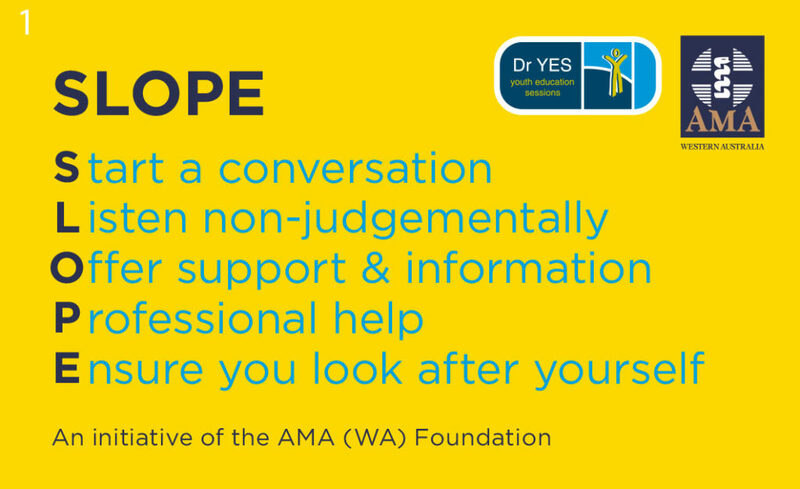 Ask the person if they need help to manage how they are feeling. It is important to become familiar with services available locally and online. If they feel they do need help, discuss the options they have for seeking help and encourage them to use those options. Encouraging them to see their GP or school counsellor. If they do not want to seek help ensure you should find out if there are any specific reasons as to why this is. They may be based on mistaken beliefs (e.g. Confidentiality, cost). You may be able help the person overcome their worry about seeking help. If the person still doesn’t want help after you’ve explored their reasons, let them know that if they change their mind in the future they can contact you. You must respect the person’s right not to seek help unless you believe they are at risk of harming themselves or others. Sometimes it can be quite overwhelming or even distressing when speaking to someone about the problems they may be experiencing. It is important that before you continue to help the person that you are also looking after yourself. You yourself may need to speak to someone and make sure you’re not too overwhelmed or upset by what the person is telling you. Though sometimes, your friend might need a bit more support and that’s when you can suggest professional help. This could involve encouraging your friend to see their GP or a relevant service.